Single-image exposure time is limited. This comet is moving extremely fast. Exposure longer than 1 min will result in a trail of its movement. Stacking and centering comet doesn't help to improve the S/N of the background. It only improves the S/N of the comet. Stacking and centering on stars helps improve the S/N of the background, but it leads to a trail of the comet (unwanted). The tail of the comet is hard to recover. The tail has a much less brightness. With the poor S/N of the background, it can hardly be recovered and distinguished. Any tips that help to improve the quality of the comet images? Here are some photos I managed to photograph. 12 x 65 sec. total exposure, ISO 6400, f5.6, 400mm, centered on comet. 12 x 65 sec. total exposure, ISO 6400, f5.6, 400mm, gif animation. Edited by jackyjsy, 11 February 2019 - 02:31 PM. I am visual only, and can't help on the AP questions you have posted. However, I do have a question about this particular comet. I was out on Friday night under reasonable skies with a 102mm APO refractor and could not see this by eye...according to the maps, I should have been right on it, but no luck. As you have been setting up your great images (the video of it moving is great! ), can you see it with just visual, or am I asking too much for 102mm? There are ways to combine comet stacking and star stacking - can be done with DSS or PI. But for good results a good number of sub frames is required. Mike, comet 2018 Y1 (Iwamoto) should be about mag 6.5 now so about visible with plain eyes. Should be easy with any scope. No. I was using 8x40 binoculars for my visual observation. I can barely see some fuzzy white thing in that region. I couldn't really say that I saw this comet for sure. I think that is because this comet is so diffuse and sadly our eyes are not good at seeing colors as DSLR sensors. I think you can see some fuzzy white thing with your 102mm telescope. 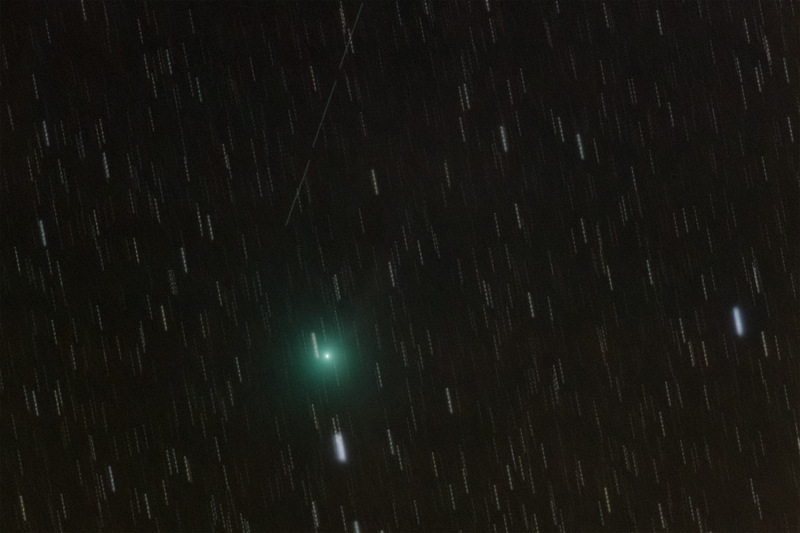 The comet looks pretty distinguishable green in the DSLR image, though. Edited by jackyjsy, 11 February 2019 - 02:50 PM. OK...thanks for those hints from you and einarin...I am going to try again when the conditions are good (snow predicted for next 3 days though). I thought I should be able to see it too, as I can readily visualize 9 and 10 mag stars. I have tracked diffuse comets before, so I have had some success at recognizing their fuzzball image, but just could not pick this one up.....I will let you know what I find! Your comet images are quite nice, both the still and the video. Just for information purposes. This is a very complicated way to do better, it will not be worth it for most. Already being a PixInsight user is necessary, this requires careful adjustments and experimentation, it's very far from automatic. Typical PixInsight. Step 2. Buy this book. Step 3. Follow his instructions on pages 319-327 (yes, it takes 8 pages, although about half is illustrations) to use the CometAlignment process. That took me maybe 5 hours. Maybe 10. Yes, you can find webpages with instructions, but, especially in this case, I feel they're significantly more difficult. Here are my results on Comet 46P. Still (decent) and video (which is nowhere near as good as yours). Another 5-10 hours on the video could have improved it, more color, less effect from thin clouds, maybe could remove the telephone wire. But I had had enough. Another illustration of why the $250 price of PI pales in comparison to the time and effort needed to learn and use it. Edited by bobzeq25, 11 February 2019 - 05:52 PM.